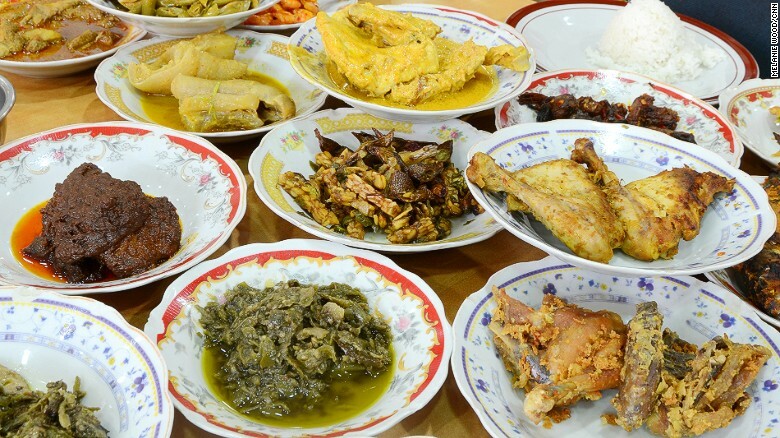 Konten di laman ini dikutip dari sebuah artikel berjudul judul “40 Indonesian foods we can’t live without” yang dimuat tautan ini. Artikel ditulis oleh Sara Schonhardt untuk CNN. Hak cipta foto-foto makanan yang terdapat di laman ini adalah milik Melanie Wood. 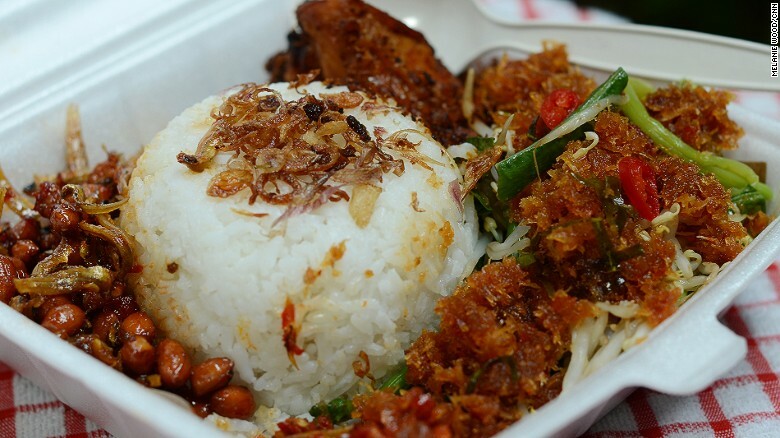 (CNN) At a poll CNN did a few years ago, our readers voted rendang the most delicious food in the world. 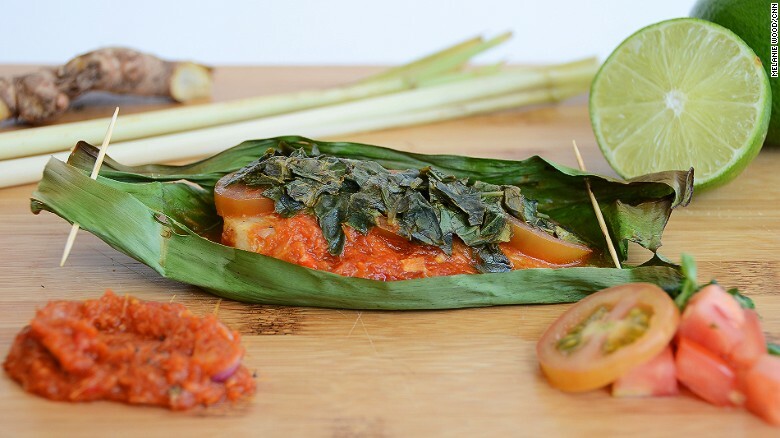 It’s time to give Indonesia’s culinary credentials some time in the limelight. Here we run through a mouth-watering array of broth-soaked noodles, fiery curries, banana-wrapped fish and vegetable salads with sweet peanut dressing. 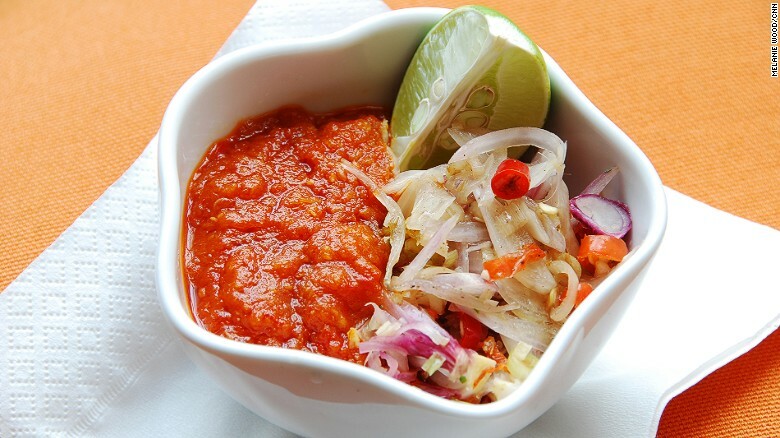 Sambal While technically more of a condiment, the chili-based sauce known as sambal is a staple at all Indonesian tables. Dishes aren’t complete unless they’ve a hearty dollop of the stuff, a combination of chilies, sharp fermented shrimp paste, tangy lime juice, sugar and salt all pounded up with mortar and pestle. Satay These tasty meat skewers cook up over coals so hot they need fans to waft the smoke away. Whether it’s chicken, goat, mutton or rabbit, the scrappy morsels get marinated in turmeric, barbecued and then bathed in a hearty dose of peanut sauce. 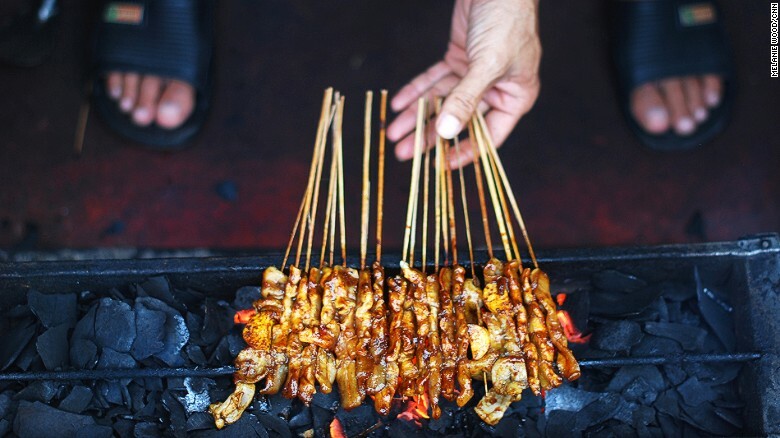 Other nations now lay claim to sate, but Indonesians consider it a national dish conceived by street vendors and popularized by Arab traders. Each vendor seeks distinction, but “sate madura” — served with rice cakes (ketupat) and diced cucumber and onion — is distinguished by its boat-shaped street carts. 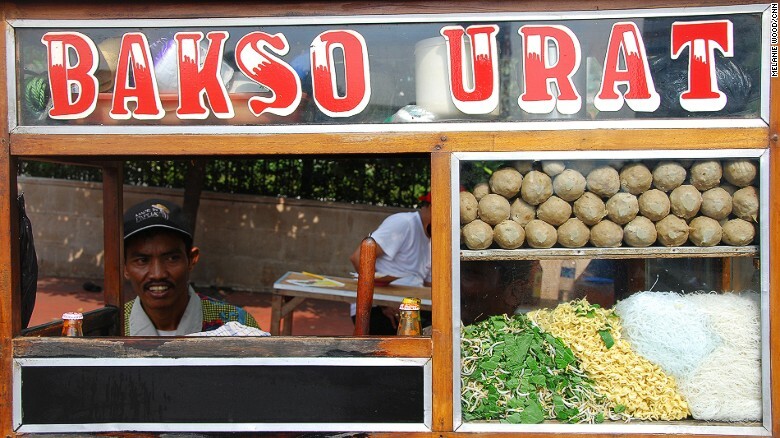 Bakso A favorite among students, this savory meatball noodle soup gained international fame when U.S. President Barack Obama remembered it as one of his favorites during a visit to Jakarta. The meatballs — springy or rubbery, the size of golf balls or bigger — are made from chicken, beef, pork or some amorphous combination of them all. 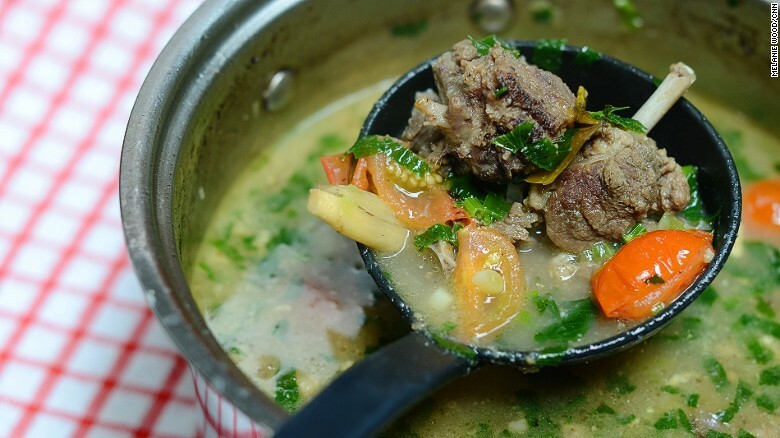 Soto This traditional meat soup comprises a broth and ingredients that vary across the archipelago. Common street versions are made of a simple, clear soup flavored with chicken, goat or beef. 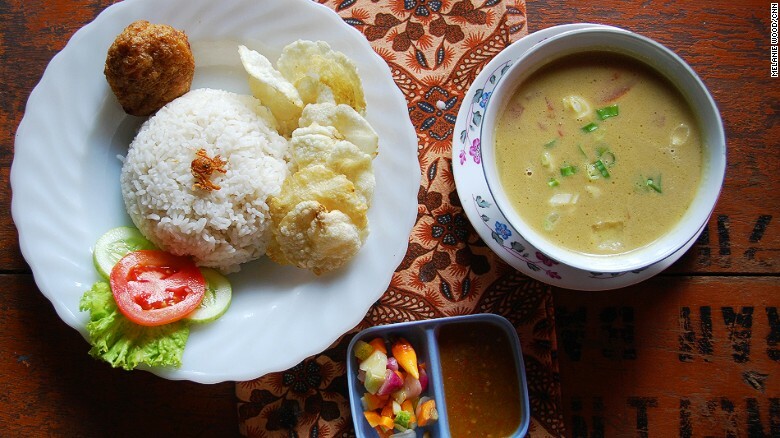 In Jakarta, home of the indigenous Betawi, soto Betawi garners fame with its sweet, creamy, coconut-milk base. 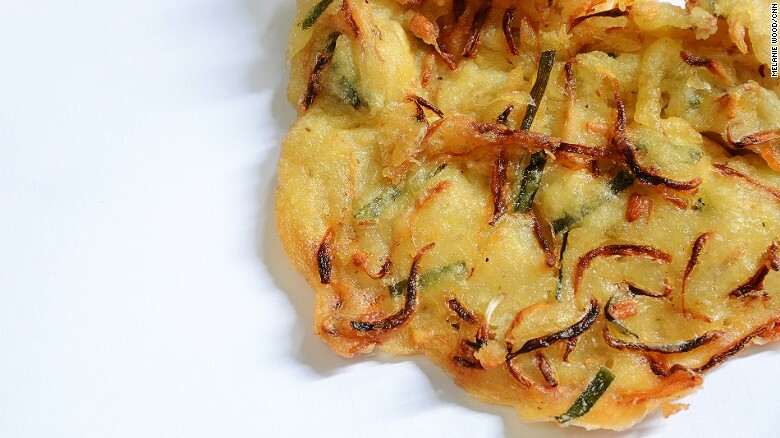 It’s usually topped with crispy shallots and fried garlic, and as much or little sambal as taste buds can take. Nasi Goreng Considered Indonesia’s national dish, this take on Asian fried rice is often made with sweet, thick soy sauce called kecap (pronounced ketchup) and garnished with acar, pickled cucumber and carrots. Gado-gado Literally “mix-mix,” the term gado-gado is often used to describe situations that are all mixed up — Jakarta, for instance, is a gado-gado city. As a food, however, it’s one of Indonesia’s best-known dishes, essentially a vegetable salad bathed in the country’s classic peanut sauce. At its base are boiled long beans, spinach, potato, corn, egg and bean sprouts coupled with cucumber, tofu and tempe. Nasi Uduk A perennial favorite among native Betawi, nasi uduk is rice cooked in coconut milk and includes a pinwheel of various meat and vegetable accoutrements. It almost always includes fried chicken, boiled eggs and tempe (soybean cake) with anchovies and is topped with emping (melinjo nut crackers). It’s cheap, fast and popular among lunchtime crowds. Nasi Padang Singaporeans may say they can’t live without it, but nasi padang, named after its birth city in Sumatra, is 100% Indonesian. Nasi padang is a meal with steamed rice accompanied by more than a dozen dishes — goopy curries with floating fish heads or rubbery cow’s feet — stacked up on the table. Ayam Goreng The key to Indonesian fried chicken is the use of small village birds, whose freedom to run around the yard makes them tastier than the big chunks of meat at KFC. 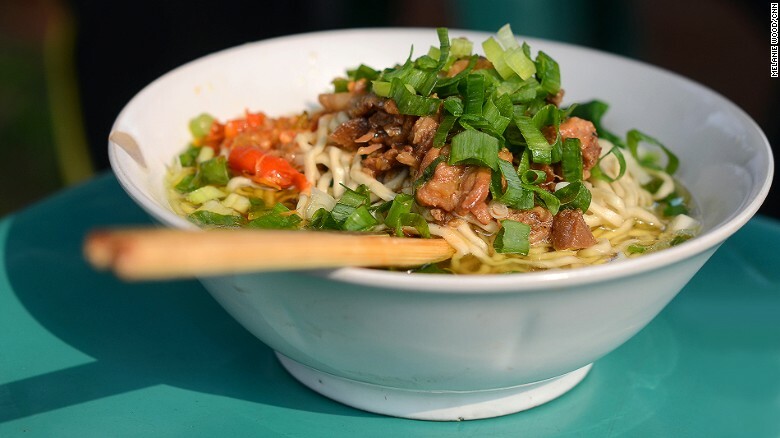 Bakmi Goreng Noodles compete with rice for carbohydrate of choice in Indonesia, ranging from broad and flat (kwetiau) to scrawny vermicelli (bihun). The best are bakmi — pencil-thin and, in this case, fried with egg, meat and vegetables. Vendors add their own special spices for distinction, but the iconic Bakmi Gajah Mada garners a cult following. 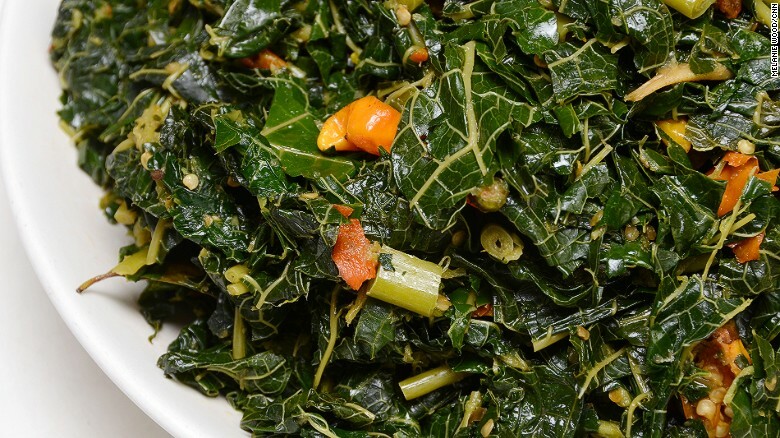 More modern outlets now make noodles from spinach and beets. Gudeg Fit for a sultan it may not be, but gudeg is certainly the signature of the royal city of Yogyakarta. The sweet jackfruit stew is boiled for hours in coconut milk and palm sugar, making the fruit so soft and tender it falls apart with little chewing. Other spices are thrown into the mix but teak leaves give it a brown coloring. 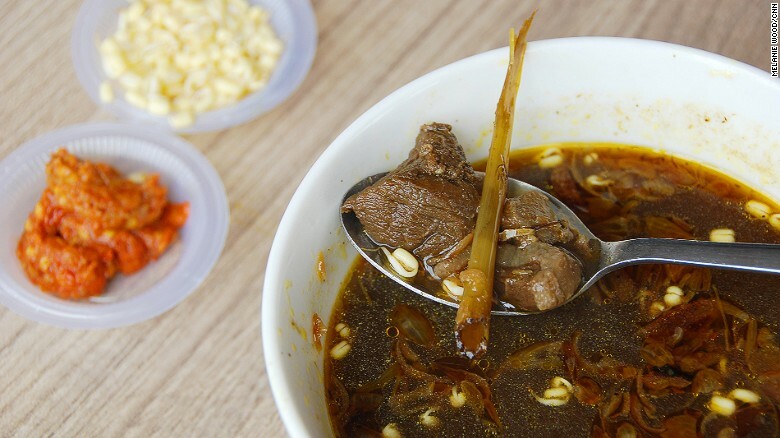 Rawon A beef stew from East Java that goes heavy on the keluak nut to give it a nutty flavor and a deep, black color. The soup base also mingles with garlic, shallots, ginger, turmeric and red chili to make it nice and spicy. Pecel Lele The sight of fried catfish may surprise first-time diners since it looks almost the same as it does living. 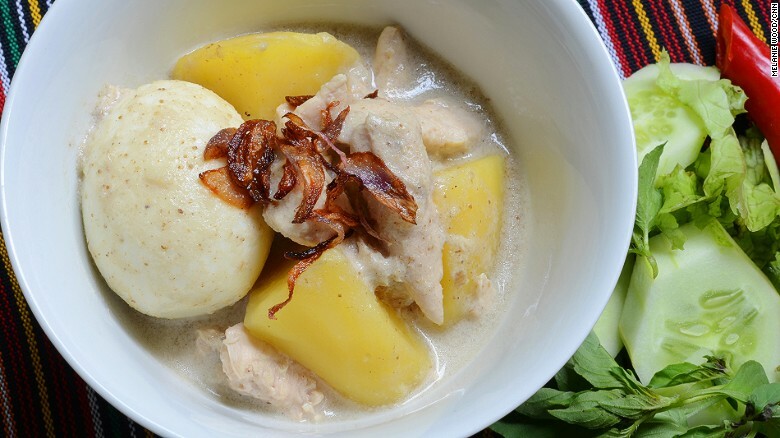 Opor Ayam Small diners, called warungs, now sell this traditional dish of braised chicken in coconut milk on a daily basis. Still, it remains a staple on tables around the end of Ramadan, when it’s served with packed rice cakes (ketupat). 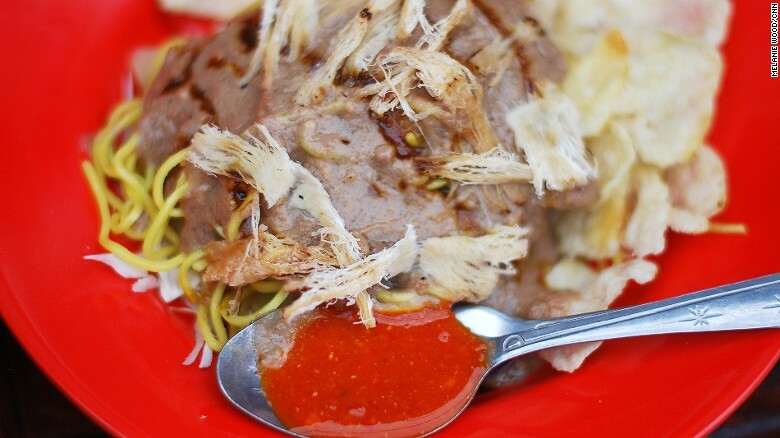 Mie Ayam For this dish, bakmie is boiled in stock and topped with succulent slices of gravy-braised chicken. Chives and sambal add extra flavor — but if it’s done right little else is needed. 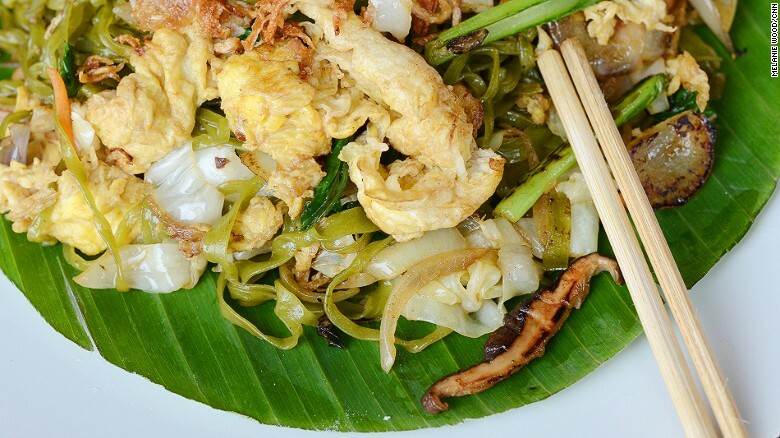 Unlike most Indonesian cuisine, where the secret is in the sauce, the clue to a good mie ayam is the perfect al dente noodle. 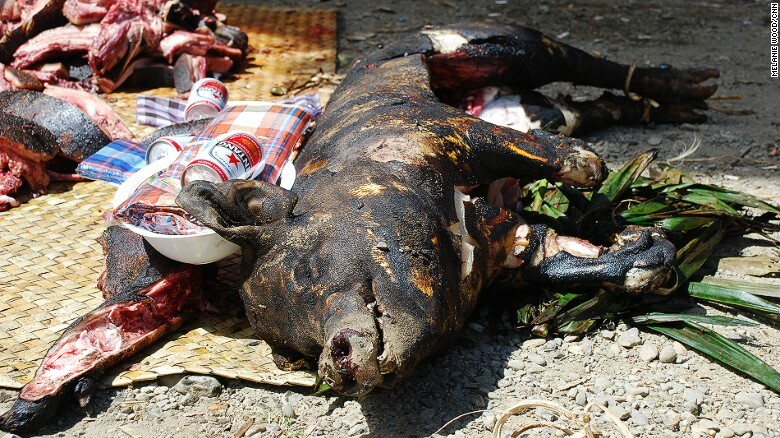 Babi Guling Pork is uncommon in this Muslim majority nation, but we had to include roast suckling pig given the near hysteria it generates on the Hindu island of Bali. 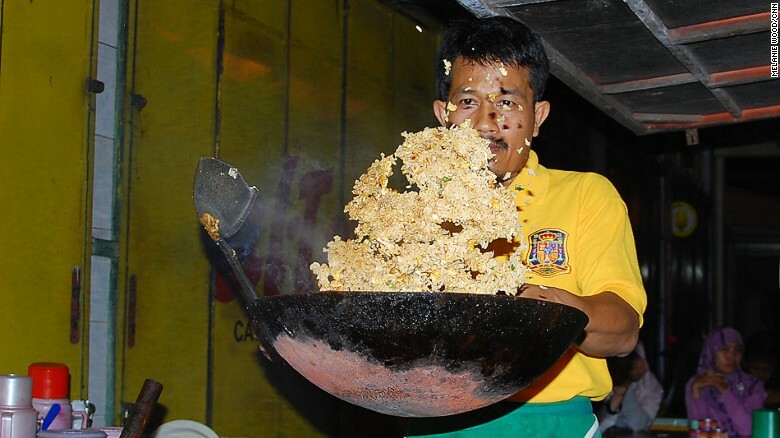 The Balinese respect their food and lavish attention on its preparation. Before spit-roasting the pig they bath it in coconut water and rub it with chili, turmeric, garlic and ginger to ensure succulence. Gulai Gulai is the common name for curry dishes, namely those from north Sumatra. 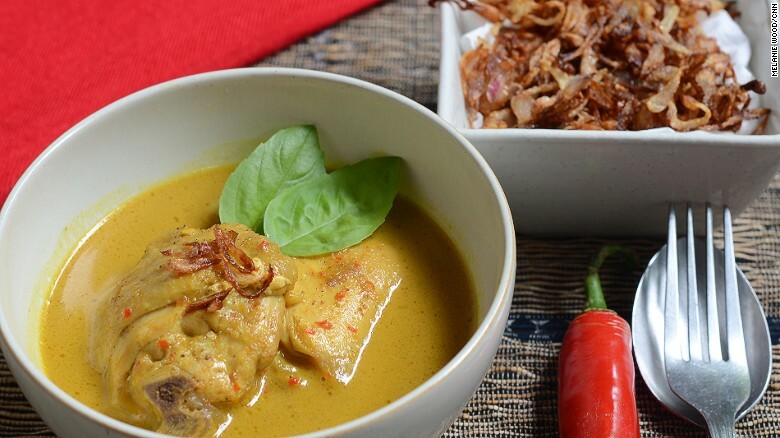 Indonesian curries have regional variations that depend on the types of meat and fish available — though gulai almost always incorporates cinnamon. 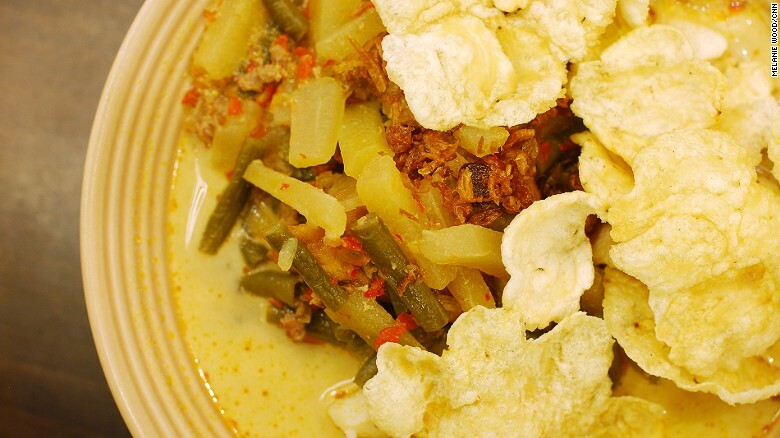 Opor and rendang can be considered gulais, but better to try out the rainbow of other options. Bubur Ayam From blue-collar workers to government ministers, almost everyone starts their day with this rice gruel, a savory porridge served with soy sauce, fried shallots, shredded chicken, beans and crackers. Bakpao Jakarta gridlock may be a blessing for the bakpao market. 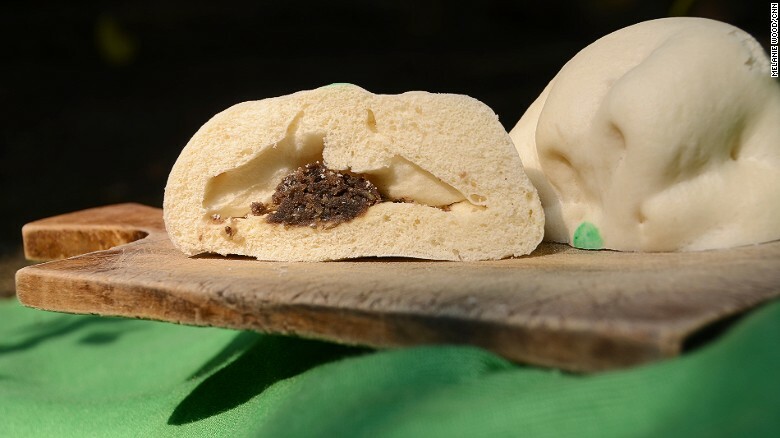 Vendors often line busy roads during rush hour to offer these fluffy meat-filled buns to hungry passersby in need of a snack. Sweet offerings include chocolate and green bean, indicated by a colored dot on top. 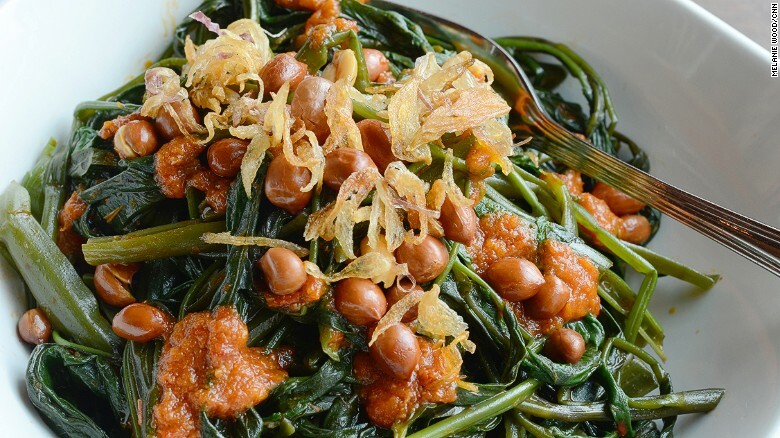 Asinan Sayur When palates crave the opposite of Javanese sweetness, this pickled vegetable salad offers reprieve. The secret is in the dressing, a thin peanut sauce swirled with palm sugar to offset the salty snap of preserved mustard leaf, carrot, cabbage and cucumber. 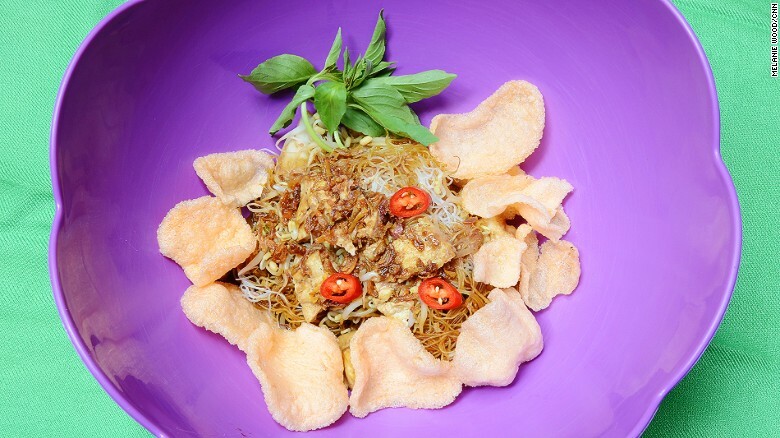 The krupuk cracker crunch comes from a yellow disc made with egg noodles. Cah Kangkung Otherwise known as water spinach, a common river weed, kangkung gets stir fried with sweet soybean sauce, huge slices of garlic, bird’s-eye chili and shrimp paste to take it from a poor man’s food to something with a kick. 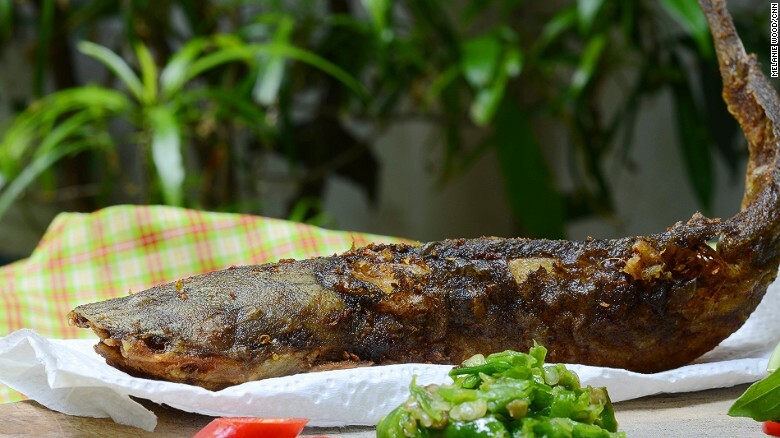 Pepes Ikan Pepes signifies the steaming of food in banana leaves, which gives it an earthy flavor that works well with the rich Manadonese spices (woku) it’s coupled with. 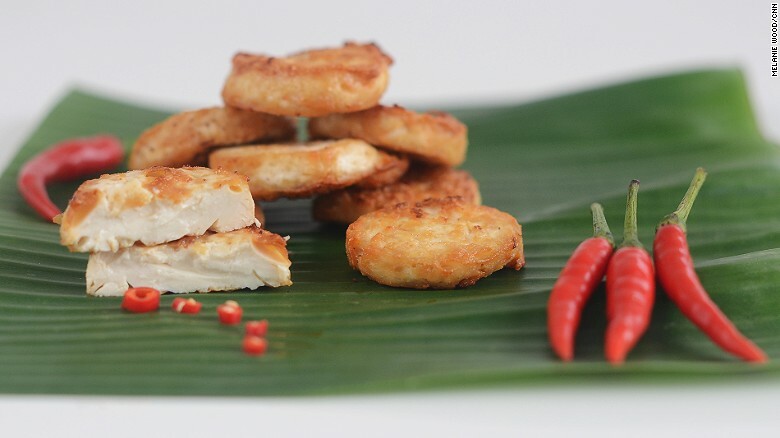 Pempek According to lore, the name pempek refers to the old Chinese man who first produced these fish and tapioca cakes from Palembang in South Sumatra. 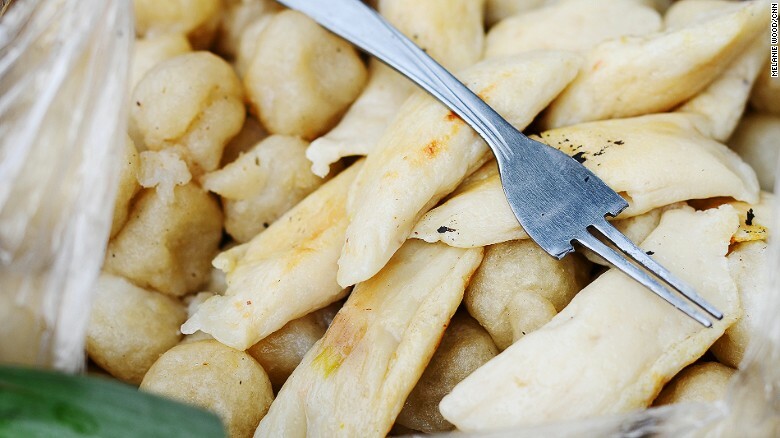 Now a Palembang specialty, pempek or empek-empek comes in a variety of shapes and sizes. Perkadel So simple it’s often overlooked, Perkadel’s unassuming appearance belies its flavorful punch. 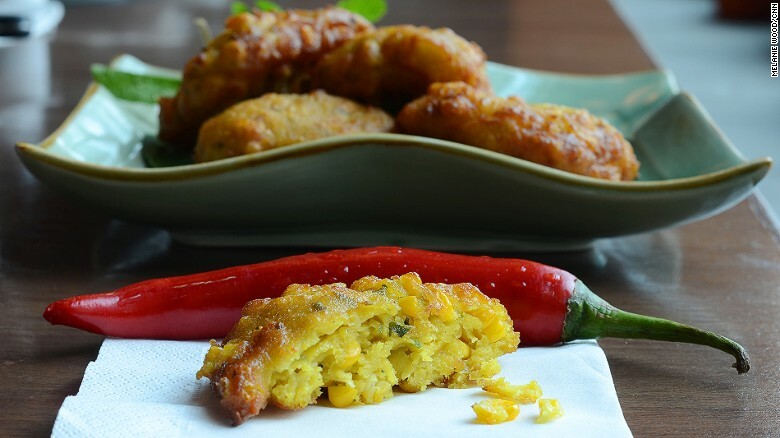 A distant relative of Dutch minced-meat frikandel, these croquettes are either potato based and filled with beef or made from corn (perkadel jagung). Martabak Think of a spongy, thick crepe made with 10 times the lard and you’ll be somewhat close to imaging martabak. 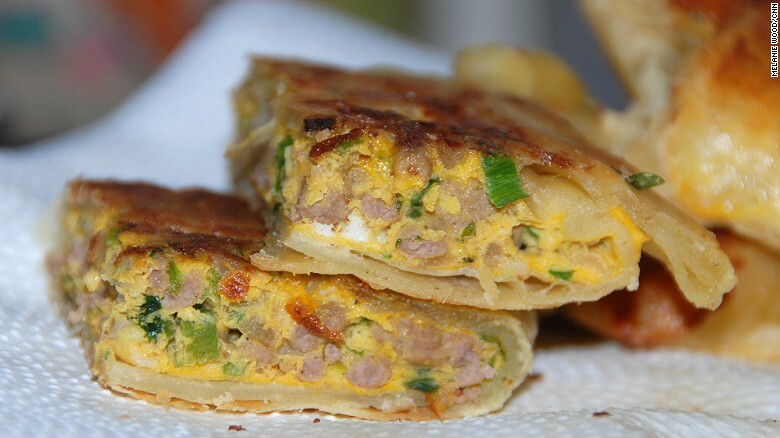 The sweet version looks more like a pancake filled with gooey chocolate, peanuts or cheese, while the savory one is made from crispy pulled pastry like filo that is flattened in a wok as egg and minced meats are rapidly folded in. 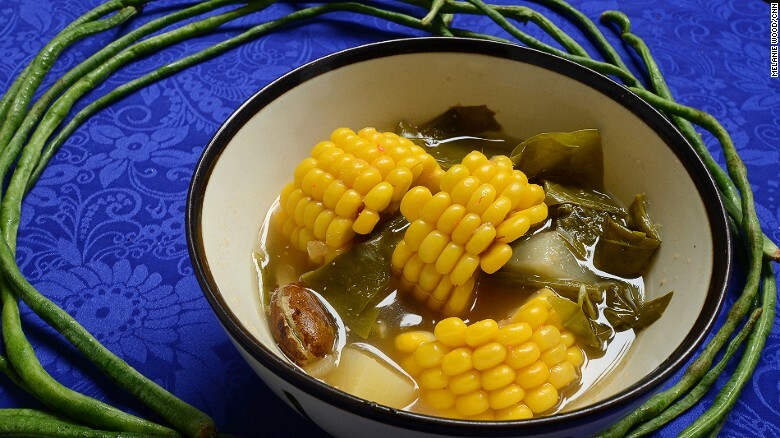 Sayur Asem This clear, refreshing soup derived from tamarind pairs well with fried food since it’s stocked with vegetables and some of Indonesia’s most interesting ingredients: melinjo, bilimbi, chayote. 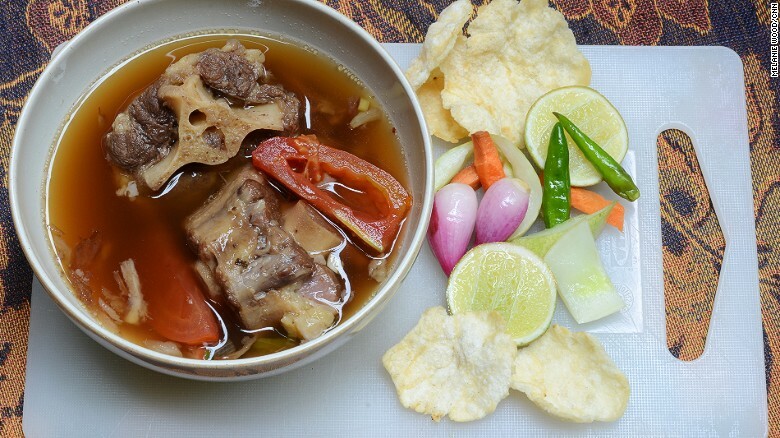 Sop Buntut Revitalized by the chef at Hotel Borabodor in 1973 after a food and beverage staffer saw a government minister eating a bowl on the street, oxtail soup is loved by Indonesians from all classes. The high-end version — now the domain of Indonesia’s diplomatic corps — uses imported Australian beef, 7,000 kilograms a month to be precise, and comes complete with steamed rice, pickles, lime and sambal. Ketoprak Not to be confused with the theatrical drama of the same name that re-enacts Javanese legends, this Ketoprak is made from vermicelli, tofu, packed rice cake and bean sprouts. 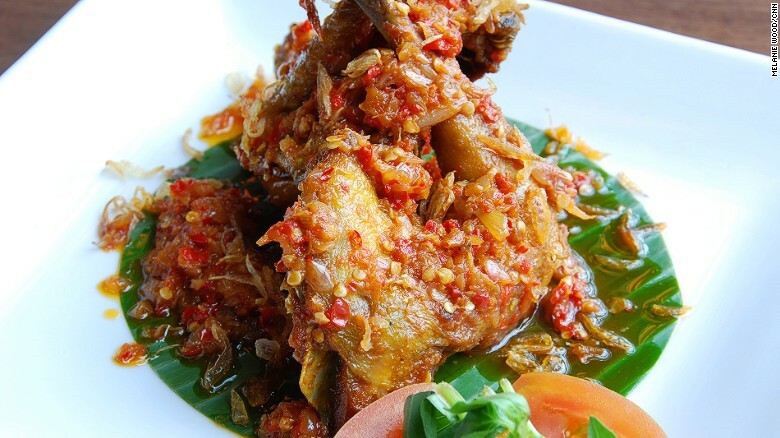 Balado Terong The color of this dish is enough to set taste buds going. 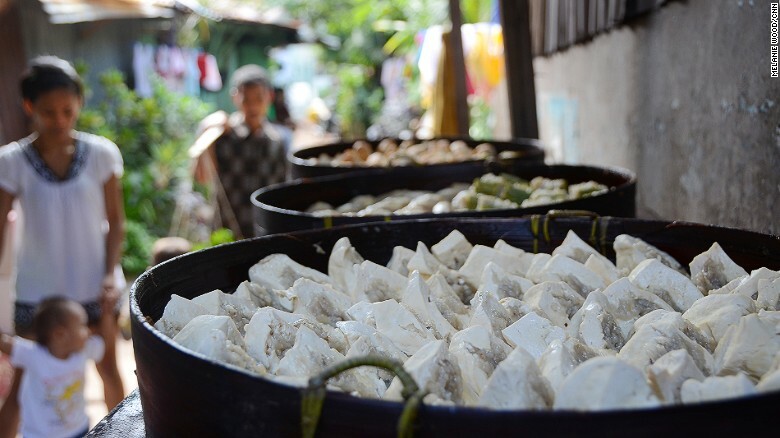 Lontong Sayur Boiled for hours in coconut leaf casings, the glutinous packed rice cake known as lontong is one of the best vehicles for pairing with thick peanut sauces and curries. It serves as the base for this savory morning favorite, a coconut-milk curry made with young papaya, soy-braised tofu and hard-boiled eggs. 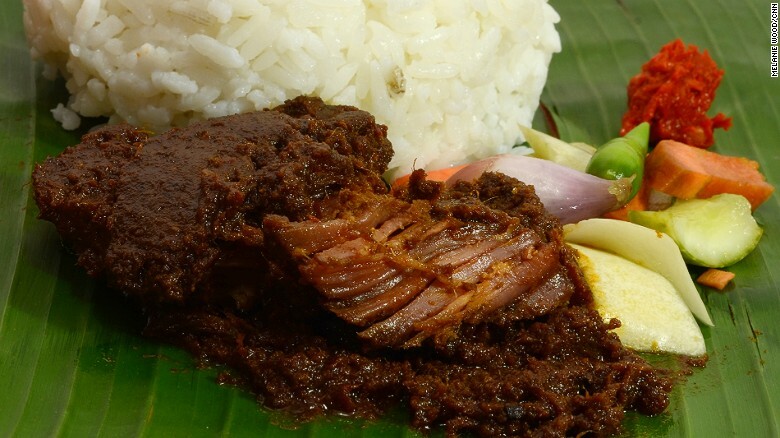 Rendang Perhaps Padang’s most famed curry, rendang is not an everyday food since it takes time and skill to make. Its secret is in the gravy, which wraps around the beef for hours until, ideally, it’s splendidly tender. Tahu Gejrot These clouds of golden, fried tofu look like little packages behind the windows of the boxes from which they are sold. Tofu is a poor man’s snack, but that also makes it prevalent. Sop Kambing If Indonesia ever got cold enough to necessitate a winter stew, sop kambing would be even more popular. A robust soup with a yellow broth full of celery, tomato, and great chunks of goat meat, this dish could make the Campbell’s soup man quiver. Be warned if you have high blood pressure since the dish will heat you up. 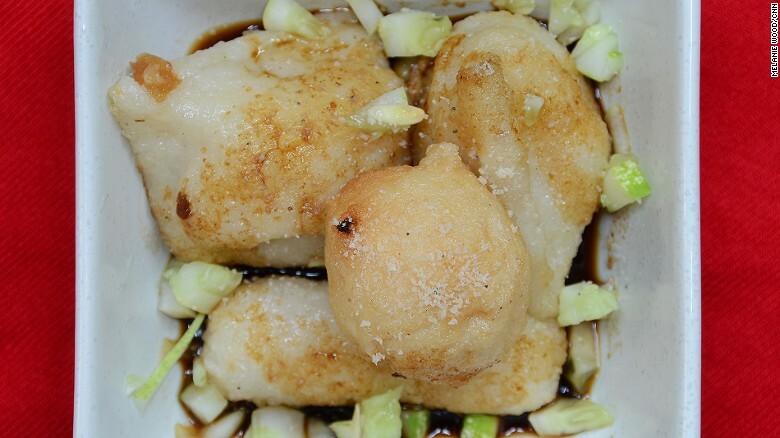 Siomay Think of it as Indonesia’s version of dim sum — traditional steamed fish dumplings known in China as shaomai. 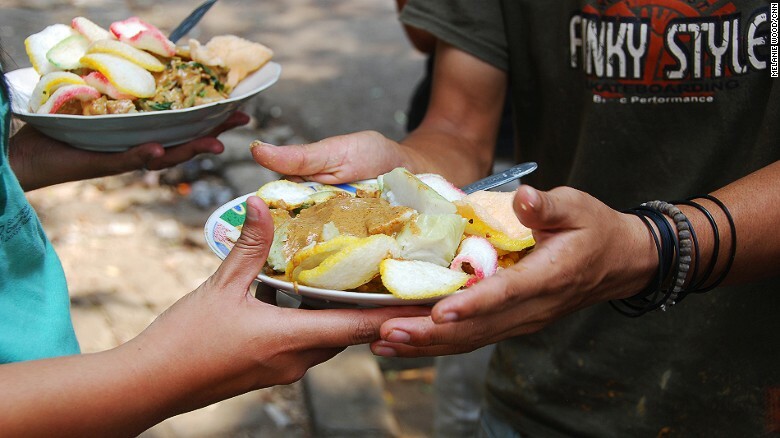 A complete portion comes with a steamed potato, cabbage, egg, and bitter gourd, and is served with a boiled peanut sauce similar to gado-gado. Perhaps Indonesia’s most ubiquitous traveling street food, the best way to dine on siomay is from a bicycle vendor, who carts his large steamer around on the back of his bike. Ikan Bakar Grilled fish, plain and simple. 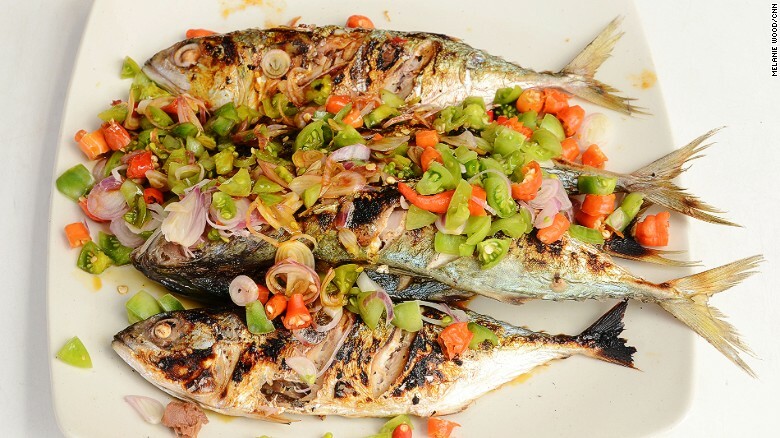 But in a country with more than 17,000 islands, fish is bound to feature prominently. 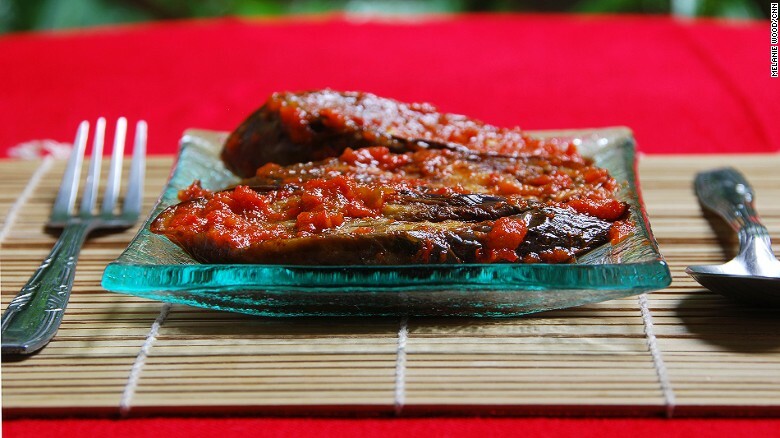 While squid and prawns have a place in Indonesian cuisine, ikan bakar gets a far better showing for a fleshy texture that is great for dipping. Daun Pepaya Papaya is one of the fastest growing trees in Southeast Asia, and its bitter leaves are great for sauteing. Otak-otak Another famed fish cake from Palembang, otak-otak has a more charming appearance, since it’s wrapped in banana leaves before being grilled over charcoal. 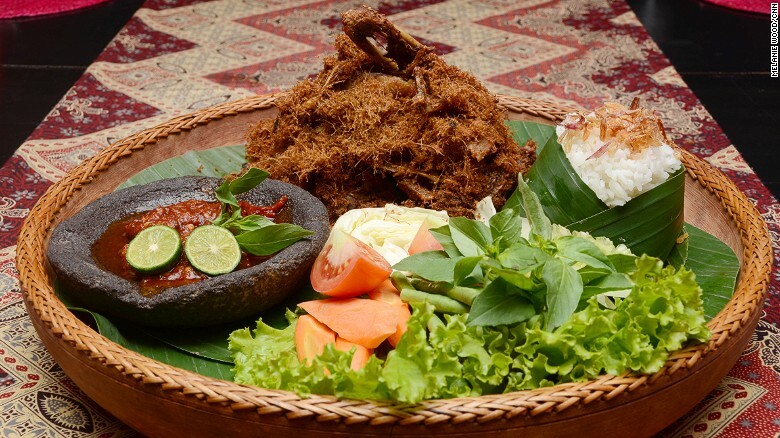 Bebek Goreng Ducks are common companions to rice fields around Indonesia, but they can be difficult to prepare for consumption. Too often fried duck comes as a mass of tiny bones and overly fried oily meat. That doesn’t make it any less worthy of the top 40, though. 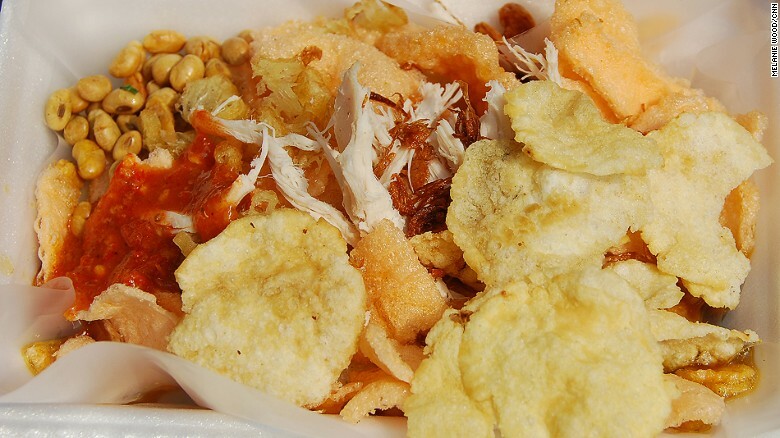 Gorengan Or simply “fried foods,” gorengan are the most prolific snacks in all of Indonesia. 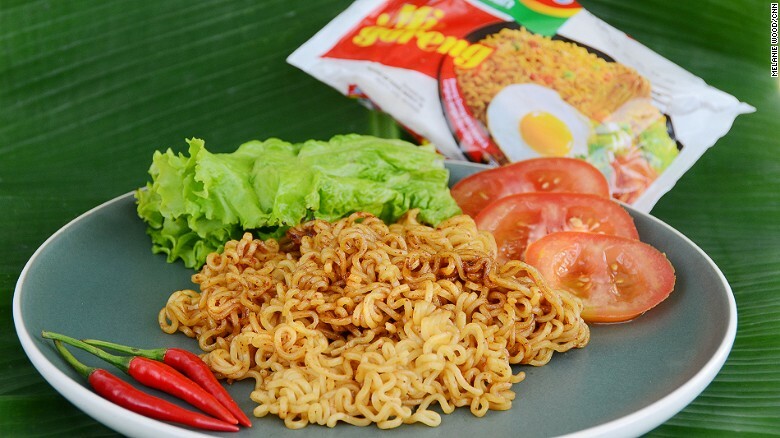 Indomie f you had to name one food Indonesians couldn’t live without, it would have to be one that is easy to transport, since they’re often on the go.